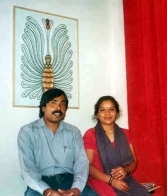 Saroj was initiated into Gond painting by her husband Venkat Singh Shyam. As a child she would drawdigna on the wall as was usual among children. But she had never though she would paint one day. The main motif of her work is the world of Baigas. As a child she would observe the Baigas who lived atop a hill in her village RASOI. Another motif is the Gond tales which Grandmother would narrate to her. The tale of the Naag-Naagin (cobras) who assume half human forms on moonlit nights and dance away in ecstasy had influenced her a lot. The world of fantasy has been a pre-dominant theme though for Saroj, the fantasies are as real as the trees and rivers. River Narmada has been another motif of Saroj’s paintings who feels women’s suffering is akin to that of the Narmada’s. She feels the same about Dharti Mata, the earth.